Red brocade italian luxury groom suit with golden embroidery and mandarin collar. Gold-black embroidery on the front, re... Red brocade italian luxury groom suit with golden embroidery and mandarin collar. Gold-black embroidery on the front, rear, collar and pocket flaps. Single rhinestone frog closure. Redingote-style seams and single vent at back. Angled flap pockets. Waistcoat with lapel made from brocade red fabric with gold embroidery. 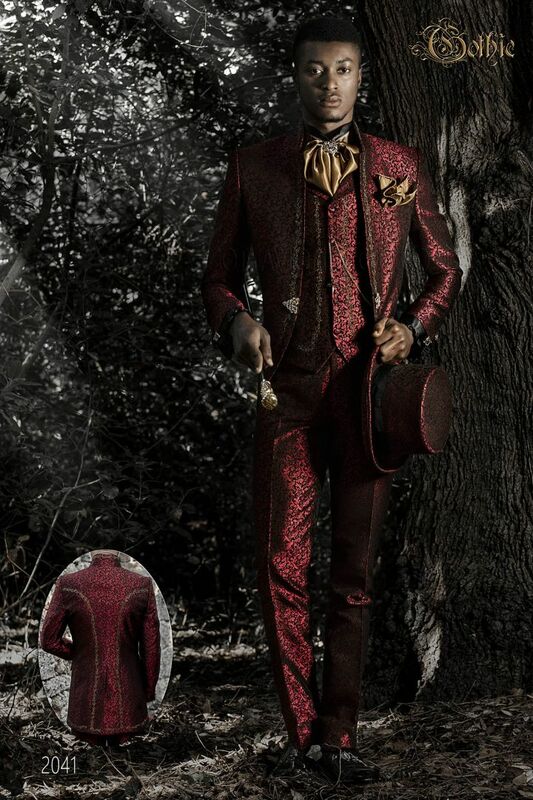 Red brocade waistcoat with vintage Baroque lapel. 5 covered tonal buttons and 2 double welt pockets. Black and golden fl... Red brocade waistcoat with vintage Baroque lapel. 5 covered tonal buttons and 2 double welt pockets. Black and golden floral embroidery on the front and back lining with elastic band to adjust width. Black satin shirt with Beethoven collar and covered button arrangement. Convertible cuffs with patterned buttons and ruf... Black satin shirt with Beethoven collar and covered button arrangement. Convertible cuffs with patterned buttons and ruffles on cuffs and placket. Golden satin Plastron Tie and Handkerchief Set Handmade. Black cane made from wood. Gold-tone knob with sunflower embellishment. Gold-tone knob with leaf embellishment. Same co... Black cane made from wood. Gold-tone knob with sunflower embellishment. Gold-tone knob with leaf embellishment. Same colour detail at the lower end. Slippers made from black patent leather with black and gold-tone 'ON' embroidery. Baroque-style nickel-tone cufflinks with drop design and topaz-tone rhinestone at centre. Nickel-tone crown cravat clasp with topaz-tone rhinestone embellishment. Antique gold-tone chain with sword pendant and diamante embellishment.